​"nice Apartment in a good location"
The deal enters the third level! If 66'666 individuals book the WinterCARD 2018/19 until Oct 31, 2018, the deal will be concluded and all registered buyers will receive their WinterCARD 2018/19 at a preferred Price. Wintercard 17/18 inclusive Kreuzboden Hohsaas! The deal enters the second level! If 77'777 individuals book the WinterCARD 2017/18 until April 22, 2017, the deal will be concluded and all registered buyers will receive their WinterCARD 2017/18 at a preferred Price. Continuing in 2017 – cableway and PostAuto bus travel included! The Citizen’s Pass was introduced in 2012, and since then has become so popular that it is hard to imagine the Free Republic of Holidays without it. This much-loved holiday must-have is therefore here to stay, and from summer 2015 you can reap all the benefits from your very first night’s stay rather than the second. ...from Winter 2016/17 you can also benefit from a cool 10 percent off when you purchase a three-day ski pass. 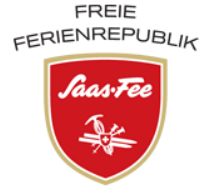 You will receive your fantastic Citizen’s Pass as soon as you arrive, ensuring total holiday freedom in the Free Republic of Holidays Saas-Fee! What are you waiting for? Book your stay in the beautiful Saas Valley now. 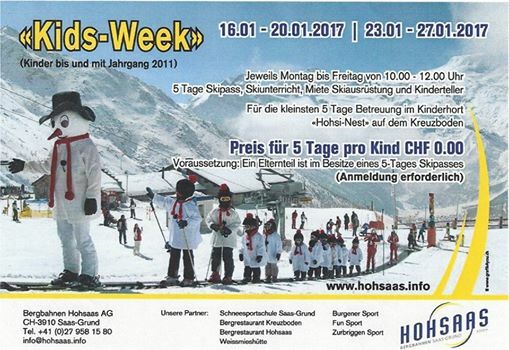 For five whole days, during the Kids’ Weeks, children can enjoy the snow above Saas-Grund without paying a penny. Ideal for parents who want to prepare their little ones for their first foray out on skis, or for kids wanting to improve their skills.